Isn't it great when you write a post on a topic you're passionate about, and you get a string of intelligent and informative comments? This creates an awesome platform to educate, and share your knowledge and experience with your clients and other consumers. Are you waiting for them to come find your great post using Google? Do you hope they just find your post by coincidence, or from a keyword search? If you want to be proactive, and get this information out to readers and clients everywhere, they'll need to know that it's there. Are you "Farming Your Blog? Many Active Rain members subscribe to each others Blogs, so we know when there's a new post. Many of our comments are made by those members. In fact, the majority of comments are from other members, but the public is still finding and reading them as well. They are probably a little less likely to subscribe or even comment, as they are not AR members. It's a fact, they are reading your Blogs. When you use the internal email function here at Active rain, you have to select each individual, one at a time. Here's what that looks like when you prepare it for your client, friend or someone from your email database. This is a great way to send your post to individuals you feel may be interested in your topic, idea, or discussion thread. Now if you want to send your post to multiple individuals, that's different! Some large networks and companies see this as spam. If you are sending your post to email addresses you have in your Outlook, Yahoo, or Google databases, then is this really spamming? I don't feel it is. Government says you can't call, now they have the "Do Not Mail Me" list, and at $3.50 per gallon for gas, who's gonna drive and knock on doors? :-) I say EMAIL!! Here's a great way to send your post by email to everyone in your database. Just create a cover message in your email, then BCC: a copy to everyone else in your database. You'll have to use an accurate link back to your post. IE (The Holiday Gift) What better way to drive readers to your post, instead of waiting for them to maybe find you someday. Not only will you be driving readers to your post, you'll be driving more visitors to Active Rain and Localism. Either way, ultimately, everybody wins. Take it one final step further, why not email your entire Blog to your email database. Instead of just sending a link to a particular post, send the link that contains all your posts, or your RSS Feed, or even your profile page. Let them choose which topics and posts they'd like to read. The point is, you are bringing it to them, and this is how to increase your readers, your business, and Active Rains continued growth and success. We can always put links on our business cards, our flyer's and signs, but are we using our email to really market our Blogs? Not just a link in the signature of a reply either, are you sending email to anybody about your posts or Blogs? This one is easy and may payoff in "Big Dividends," I'd try it. Are You Grazing on the RSS Feed? 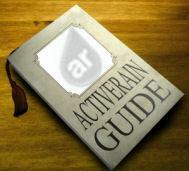 Your ActiveRain Profile - Your Masterpiece!